Growing economic inequality, increasing joblessness, global pollution and severe weather events are among the world’s most pressing threats, according to a report released today by the World Economic Forum’s Global Agenda Councils, which surveyed 1,767 leaders from academia, business, government and non-profits. 2 Persistent jobless growth – Harvard professor Larry Summers writes that this global threat is brought on, in part, by technological changes, and that “automation is certainly the biggest single contributing factor” to the problem. Our 2014 #web25 survey of technology experts found that half envision a future in which robots and digital agents have displaced significant numbers of both blue- and white-collar workers. 3 Lack of leadership – Shiza Shahid, co-founder of the Malala Fund, points out that “a startling 86% of respondents to the Survey on the Global Agenda agree that we have a leadership crisis in the world today” and points to corruption in emerging and developing economies as a major reason why. Our recent survey finds a median of 76% across 34 emerging and developing nations say corrupt political leaders are a very big problem in their countries and that bribes are seen as important for getting ahead in life in certain countries. 4 Rising geostrategic competition –Global Agenda survey respondents are particularly concerned about the potential for geopolitical conflict in the next 12-18 months in Asia, but security worries are also high in Europe and the Middle East. Pew Research’s public opinion survey in Asia shows many are concerned that territorial disputes with China and neighboring countries could lead to a military conflict. 5Weakening of democracy – While the greatest concern for the future of representative democracy comes from those in the Middle East and North Africa, there is also cause for concern in Europe. Our spring survey, before the European Union elections, found that a median of 71% across the seven EU countries surveyed said their voice does not count in the EU and 65% said the EU does not understand the needs of its citizens. 6 Rising pollution in the developing world – Once again, Asian respondents to the Global Agenda survey are more concerned about air pollution than other regions. But across 34 emerging and developing nations that we surveyed, including nine in Asia, a median of 54% see air pollution as a problem in their countries. 7 Increasing occurrence of severe weather events– An increase in these high-intensity events is characterized as “a major consequence of climate change” by Adil Najam, a Dean of Global Studies at Boston University. Concern about climate change as a threat is particularly prevalent in Latin America, Asia, Europe and Africa, but people in the Middle East and the United States are less concerned. 8 Intensifying nationalism – Gordon Brown, the former British Prime Minister, worries about growing nationalism in the United Kingdom and elsewhere, saying “we don’t need to sever connections between each other to thrive in the modern world.” With the recent closeness of the Scottish Referendum and plans for a similar vote in Catalonia, Global Agenda respondents were most concerned about an increase in nationalism in Europe. 9 Increasing water stress – The regions most affected by water stress are located in the Middle East and North Africa and Central and Western Asia. Additionally, a Pew Research Center survey found that Middle Easterners are worried about water pollution, with 87% in Tunisia and 80% in Lebanon saying it is a very big problem. 10 Growing importance of health in the economy – As developing nations grow, health care spending in those countries is also expected to increase. In fact, the most important problem facing the emerging and developing economies in our survey, after economic issues, corruption and crime, is health care. 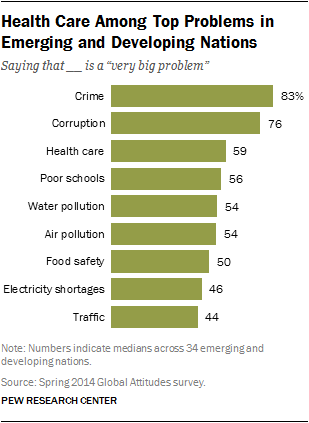 A median of 59% across 34 nations say it is a very big problem in their country.